View of Kelso Abbey in Scotland. The abbey, built in the 12th century by King David I, was one of the grandest of the Boarders monasteries. It took over 75 years to build and was one of the finest examples of Romanesque architecture in Scotland. 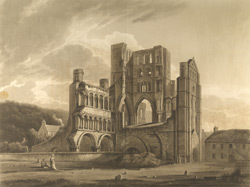 The Abbey’s church was aligned east to west, as was usual at this time – the townspeople used the western half for worship and the monks the eastern half. Unusually both the choir and the nave had north and south wings, making a floor plan like that of a cross of Lorraine. The Abbey was at one time very powerful however its position on the border with England made it vulnerable and it was frequently attacked. It was finally dissolved in the 16th century during the Reformation.